If you want to encourage your dog to drink more, consider grabbing one of these best water fountains for dogs. As you know, water is vital to all living things, including our canine companions. It not only hydrates our pets, but it also moves essential nutrients in and out of the cells of the body. Having an adequate supply of water in the body also moves waste through the intestines and helps regulate our pet’s body temperature. Getting your dog to drink enough is easier when you always have clean, fresh, cool water available at all times. Check out these best water fountains for dogs – you’ll wonder why you didn’t get one sooner. The Benefits of a Water Fountain for a Dog? Animals seem to be drawn to running water. Instinctively, they know that moving water is likely to be cleaner than a standing, stagnant pool or puddle. Water fountains provide that continuous circulation. Most dog water fountains also use charcoal and sponge inserts that continually purifies the water and takes out any floating debris. This keeps the water cleaner, improving its taste. Some dogs may be drawn to a water fountain, just because it’s more like a toy. Now that we know the benefits of having a water fountain let’s review the best water fountains for dogs in their category. The Flightbird Water Fountain dispenses water automatically when your pet is detected within five feet of the fountain. Plus, the stored water can be used for a week! The K&H Thermal Dog Bowl is a thermostatically controlled heated pet bowl that turns on and off as necessary to keep water from freezing. With a simple “step” of a paw, your pet can give himself a drink from the fountain-style Trio Gato. The easy-to-clean system in the PetSafe Drinkwell filters every drop of water by running it through both a carbon and foam filter, catching hair and dirt before they reach the pump. There’s no need to continuously replenish the water in this fountain by the Petacc company – it’s large storage capacity takes care of that issue. 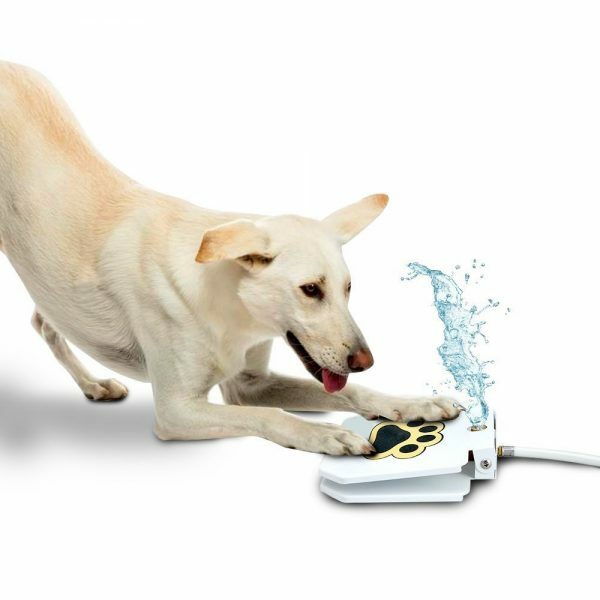 There’s no need to turn this unit on or off, or frequently replenish the water as the Flightbird Water Fountain dispenses water automatically when your pet is detected within five feet of the fountain. Plus, the stored water can be used for a week! Radar – this mode works for 90 seconds when it detects your dog within five feet of the unit. Smart – works for 2 minutes and rests for 3 minutes. Normal – works continuously for 24 hours. What’s more is the Flightbird Water Fountain will alert you to refill water when the blue light of Smart mode blinks. The water pump will then automatically stop to help protect the pump. It also provides LED nightlight functions. Must keep the fountain away from electronic equipment such as WiFi router, moving objects such as air fan and place it from the wall for 20-30 cm to avoid signal interference and rebound. May not be suitable for large dogs. What We Like – the Flightbird dog fountain with its three-modes and extra carbon filtration make for a convenient and practical dog water fountain. Do you want your dog to have access to fresh water while even outdoors? Then the K&H Thermal Dog Bowl may be what you’ve been searching for. 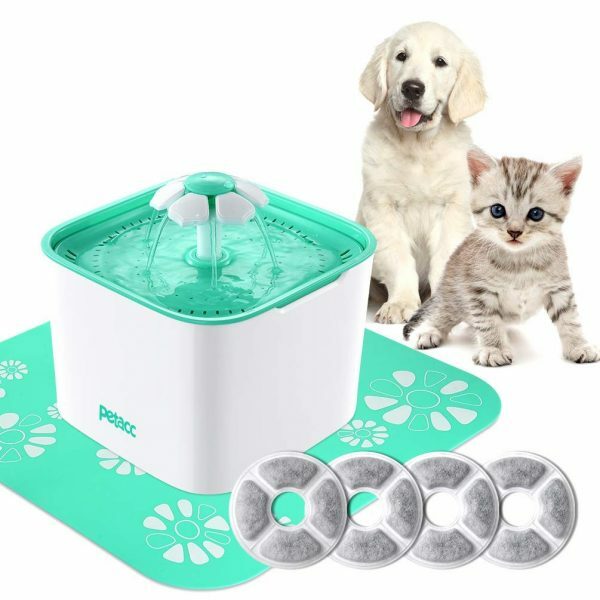 The thermostatically controlled heated pet bowl turns on and off as necessary to keep water from freezing, even at -20°F. The bowl itself is BPA-free and perfect for outdoor use. 5.5′ steel wrapped abrasion resistant cord and electronics are safely sealed inside the bowl. 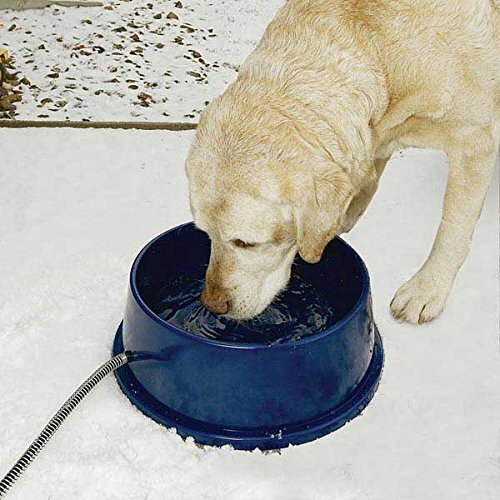 What We Like – Keeps water liquid in freezing temps so dogs can enjoy fresh water even in the winter months. If your dog loves to play in the sprinkler or with the hose, why not get him his own “on-demand” outdoor dog sprinkler system? 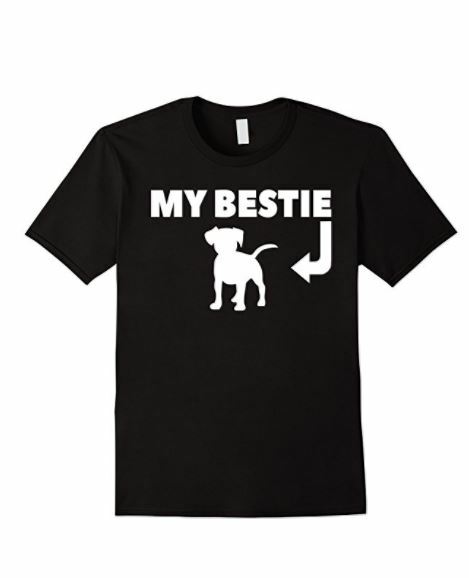 With a simple “step” of a paw, your pet can give himself a drink from the fountain-style water fountain – no more wasting water with a continuously running hose. 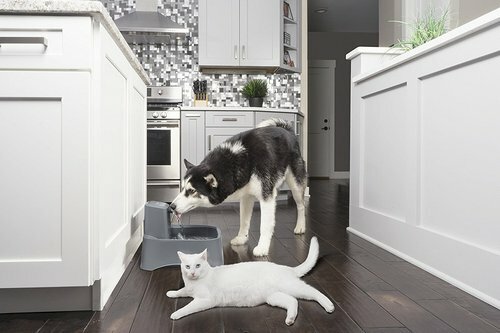 Plus, the heavy gauge steel of the Trio Gato Pet Fountain is guaranteed to last and the leak-proof copper valve and rubber friction pads help minimize movement when in use! Some dogs may need to be trained to operate this sprinkler system. What We Like – The convenience of this system makes it appealing, as well as the fact that the water is not continuously running as with traditional sprinkler systems. Encourage your canine to drink with the free-falling water from the PetSafe Drinkwell Water Fountain . The easy-to-clean system filters every drop of water by running it through both a carbon and foam filter, catching hair and dirt before they reach the pump. The constant water circulation in the bowl helps prevent bacteria growth, keeping your pet’s water fresh, clean and tasting fine. Carbon and foam filters need to be replaced. What We Like – Taking out the debris and harmful chemicals found in tap water will ensure our pets are getting a healthy drink each day. There’s no need to continuously replenish the water in this fountain by the Petacc company – it’s large storage capacity takes care of that issue. 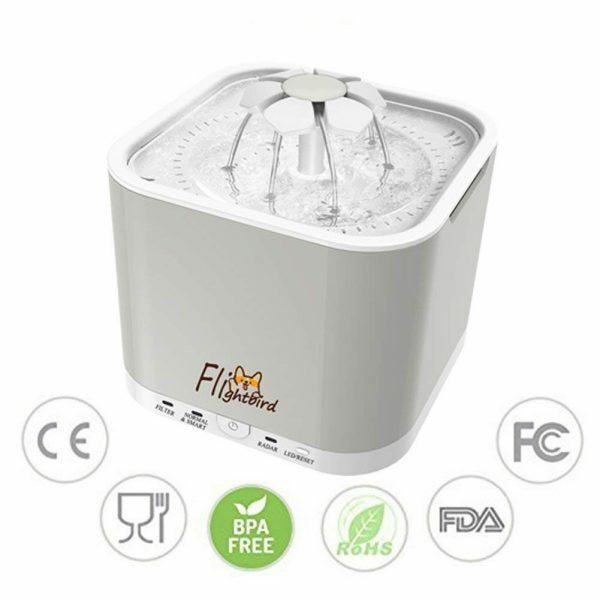 It’s made of finely polished, antibacterial PP resin material, with a BPA-free water bowl which is also non-toxic, odorless, and has obtained food-grade certification. The simple quick-release structure is designed for easy removal and cleaning, so you won’t spend a lot of time maintaining the unit. 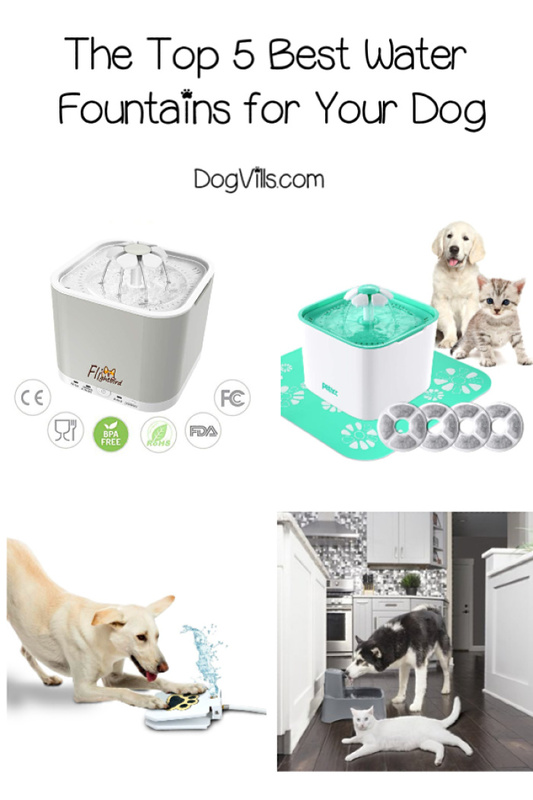 What We Like – The three water flow settings is perfect for all types of pets, and the large storage reservoir makes it very convenient to run. A dog water fountain is an excellent alternative to ordinary pet bowls. Pet fountains not only encourage more hydration but most filter the water, giving your dog a better drink every time. What do you think of pet water fountains? Would you provide your dog or cat with one of these units? Let us know your thoughts or experiences in the comments section.